Our newest widget, the dynamic widget, pure CSS and JS. 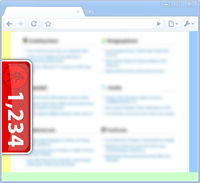 Our smallest widget fits in perfectly on every website. Like the Original, but now with different colors! Position this tab widget on the edges of your website. Add a map to your website. Copy and paste the free code below into your webpages. Choose your widget colors, then copy and paste the free code below into your webpages. Choose your widget position, then copy and paste the free code below into your webpages. Customize your widget, then copy and paste the free code below into your webpages. If you agree just paste the code into every page on your website!